Fans of 70s superpowered crimesolving ladies rejoice! ICv2 has a preview for the upcoming crossover (or maybe it’s out; I don’t get out much lately) for the Linda Carter Wonder Woman and the original Bionic Woman. Personally, I think Jaime is a bit to open with her bionics and figures out Wonder Woman’s secret way too easily but otherwise I like this idea. 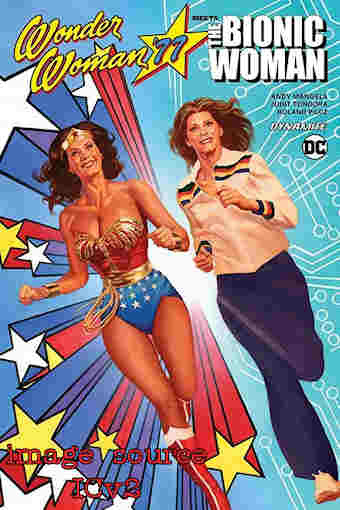 Posted by ShadowWing Tronix on October 18, 2017 in DC Spotlight, Television Spotlight and tagged 1970s TV, crossover, DC Comics, Dynamite Entertainment, Jaime Sommers, Lindsay Wagner, Lynda Carter, The Bionic Woman, Wonder Woman, Wonder Woman (TV series).